Now CloudPhysics instantly shows you the right path through this complexity. We help you understand and estimate the cost of adopting Azure—and be sure of making the smartest selection among the many available instance types and classes. CloudPhysics’ cost analytics let you accurately project the cost of running all, part, or a single VM in Azure. Run your infrastructure objects of interest in simulations of their configurations and pricing scenarios for each public cloud. You can be assured of receiving the most recent, highest-fidelity insights, since CloudPhysics collects performance data at 20-second intervals. Lower your costs even further by automatically matching lower-cost geographic regions to reduce migration outlay. With the Azure Cloud Simulator, you’ll quickly see which choices make the most financial sense, with results shown in easily understood dashboards and analytics. How Does the Azure Cloud Simulator Work? 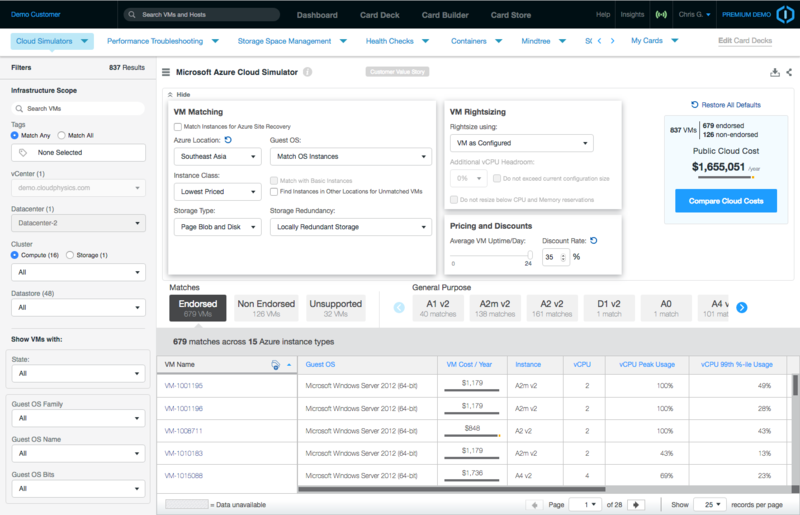 Once activated, the CloudPhysics virtual appliance collects and analyzes performance and configuration metadata on your virtual infrastructure. You see results in clear, intuitive, and easily understandable dashboards and analytics. Now you and your team can access the same verified information when planning your Azure migration strategy.